Kingfisher Church is led by Alison & Mark Bennett. 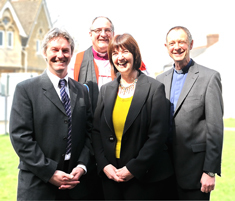 Allan is vicar of our parent church St Thomas’ Trowbridge and provides spiritual oversight to Kingfisher Church. He meets with Alison regularly to provide support and advice. Alison and Mark are supported by a leadership team of mature Christians who meet regularly to seek God’s direction for Kingfisher, to pray for the church and to make the day-to-day decisions involved in running the church.